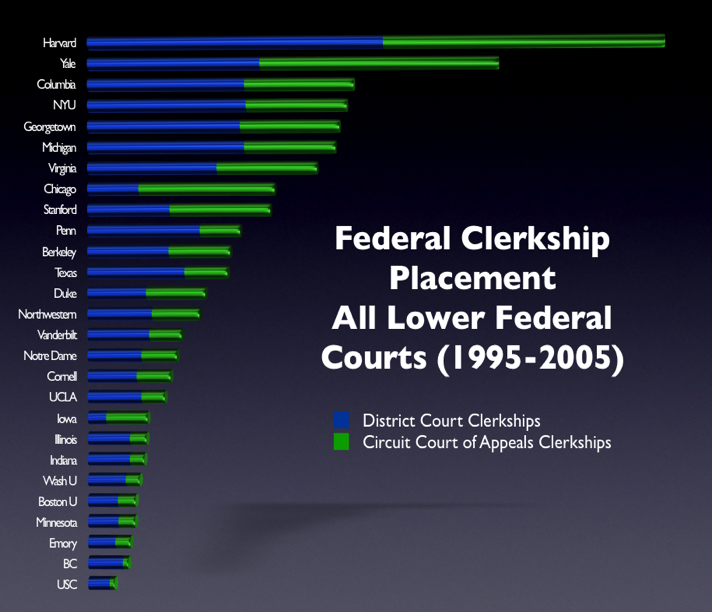 Our multipart series on the clerkship tournament continues above with an expanded edition of the law clerks data. The data is derived from my paper Hustle and Flow: A Social Network Analysis of the American Federal Judiciary (2010 Forthcoming–Ohio State Law Journal). It is important to note the above data is merely the raw data. While we obviously could threshold for number of graduates per school, we choose not to do so because we do not have any particular theoretic reason to believe that placements linearly scale to differences in size of graduating classes. In other words, given we do not know the proper functional form — we just offer the raw data. For those interested in other posts on this subject, please click on the law clerks tag. or the law schools tag.